Warm, rich chocolate, hearty oats, oozing caramel: Chocolate Chip Oatmeal Caramel Squares have it all. If the ingredients were not enough to entice you as a comfort food, this easy cookie recipe is even more appealing in that it is simple to make. The recipe calls for just 7 ingredients – and one of them is pre-made cookie dough. It’s easy to see why the bars were a favorite recipe from the iconic Pillsbury Bake-Off Contest #37 in 1996. Preheat oven to 350º F. Line an 8 x 8 baking pan with foil. Spray foil lightly with vegetable spray. In a large bowl, break up cookie dough. Stir or knead in oatmeal. Set aside ½ cup cookie dough-oatmeal mixture. Press remaining cookie dough into prepared pan. Bake 10-12 minutes or until dough puffs and appears dry. Meanwhile, in a small bowl, mix together caramel topping, four and vanilla until well blended. Remove baked crust from the oven. Sprinkled crust evenly with walnuts and chocolate chips. Drizzle caramel topping mixture evenly over bars. Crumble reserved ½ cup cookie dough mixture over caramel. Bake bars an additional 20-25 minutes or until golden brown. Remove the pan from the oven and allow it to cool for 10 minutes on a wire rack. Remove bars from the pan by lifting foil ends. Allow bars to cool completely on a wire rack about 1 ½ hours. Cut bars into 4 x 4 or 5 x 5 rows, depending on your preference. By baking the lower layer first, you prevent the bar cookie from becoming too soggy. Be sure to press the crust evenly into the pan to ensure uniform baking. 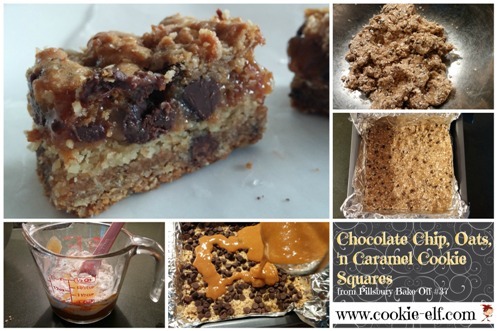 You can bake Chocolate Chip Oatmeal Caramel Squares in a greased pan, avoiding lining it with foil. But bars are much easier to remove when you simply lift the foil liner from the pan. For cleaner cuts, set the knife in the refrigerator for an hour before cutting squares. Almond Crunch Cookies: easy cookie recipe from Bake-Off #30 ..